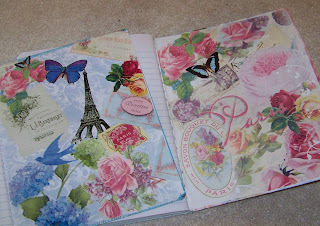 I did a show recently at new friends house ~Meg ~ she makes journals out of vintage scraps. 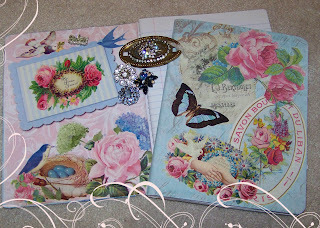 http://vintagescrapsbymeg.blogspot.com/ I absolutely just love her things ~ she inspired me to make some that are different. 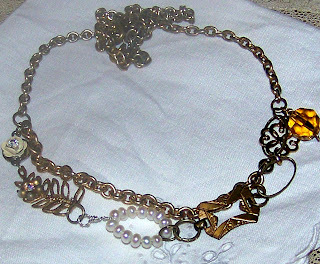 I am not sure if you can see in my photo, but I also made vintage bookmarks with little bits of charms. 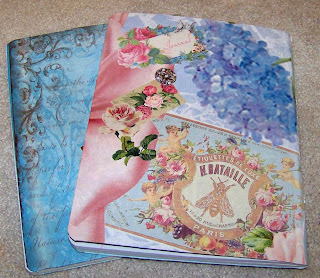 As you can see, I LOVE roses - I also love hydrangeas. 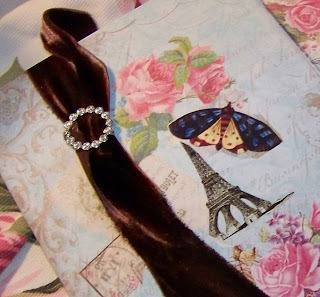 And I love this vintage brown velvet ribbon with an old rhinestone belt buckle. 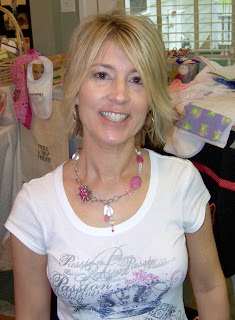 I mentioned Meg's Etsy craft show above (Vintage Scraps)... pictured here is her beautiful neighbor wearing my pink necklace that she bought...It was made for her! Here are some recent jewelry pieces I've made - I keep going back & forth on craft projects. I am so ADD - how can we get this under control. My offce here has my computer, piles of vintage jewelry scraps, rhinestones, half-made peieces, gorgeous piles of vintage roses and French perfum labels - scattered all over the floor. What a mess!! And that is just my office! What's a crafter to do? ~ and I have other "areas" throughout my house where I also make a big mess! I have really been to aqua blue colors lately. 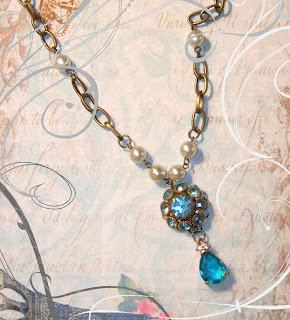 I love this necklace ~ I love these colors ~ like the carribean! Ok, so this one below is another favorite! How can I have so many favorites!! Do you ever make something & of course, you make it to sell it, right? 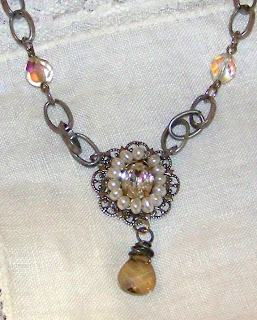 I'm supposed to make it to sell it, THEN, I'm attached to it... this necklace below is one of those necklaces. And, with most vintage pieces, what's the likelyhood you'll EVER find another one of THOSE pieces... That seems to happen to me a lot these days. I was at a craft fair this past weekend & after my friend, Lisa, bought this, another lady came up & said, oh, I really wanted that piece your friend bought! 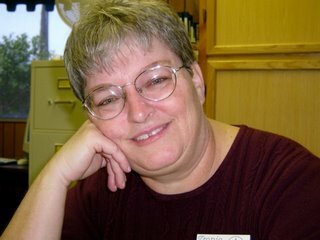 I found your blog by accident but I am glad I did. 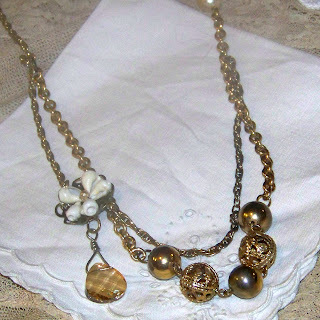 I also make jewelry out of vintage stuff I find. I love your stuff! Great shots of Carter & her Sassy Hair!